Sixty percent of those polled, including 55 percent in West Bank and 68 percent in Gaza, reject permanent acceptance of Israel’s existence. 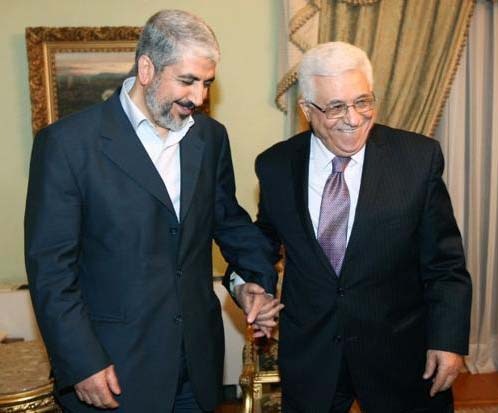 Hamas Khaled Meshaal‬ and al-Fatah leader Abu Mazen are both Jihadists. A clear majority of Arab Palestinians in the West Bank and Gaza now oppose a two-state solution to end their struggle with Israel, according to a new poll released on Wednesday. The deceptive “Oslo war process” is over. The two-state-solution is dead. The idea of dividing the state of Israel was anyhow a paper-tiger. The proposed joint Saudi-Washington D.C “peace plan” did neither put the Hebrew Bible into account. Nor Koran based Islam. The Koran is a falsification of truth, and Muhammad a false Arab prophet. To counter this falsehood, Israel must act like any other civilized nation. When its existence is under threat, containment and imprisonment of Arab criminals in the only reasonable solution. For Israel it is preferable that the forces of Jihad destroy each other. Just like they do today in both Syria and Iraq. Let us pray that God of the Bible continue to create confusion in the camp of the enemy. But if a Jihad fighter is caught alive, let him spend the rest of his life in prison. As a warning to any Arab youth. Muhammed a false Arab prophet is a creation of Catholic Church in Rome and Koran is written by a catholic priest. Muhammed couldn’t write or read. Alberto Rivera has preached about this in YouTube. If a terrorist is caught alive; why should he/she; be killed immediately instead of putting them in prison for life at tax payer’s cost or nation’s cost?????? We do not kill. We are not barbarians. A man can be saved in prison. If we kill them, we have created a martyr for Islam. Many more will copy. If they never leave prison, many youth will think twice. No fun if you can not become a shahid, but have to die an old and sick man in prison. The Presbyterian disinvestment, 2014 will prime a two-state solution just as the Dreyfus Affair primed the Anglicans/England to staff their Palestinian embassy, 1840s.